The Novice Reps won game four of their Championship final by a score of 5-1 over the Goderich Sailors to wins the series 3 games to 1 and end the season as OMHA/WOAA Dodge Cup Champions. Congratulations to the players and coaches on a great season and it is nice to see all the hard work pay off. Complete breakdown of the final games to follow shortly. 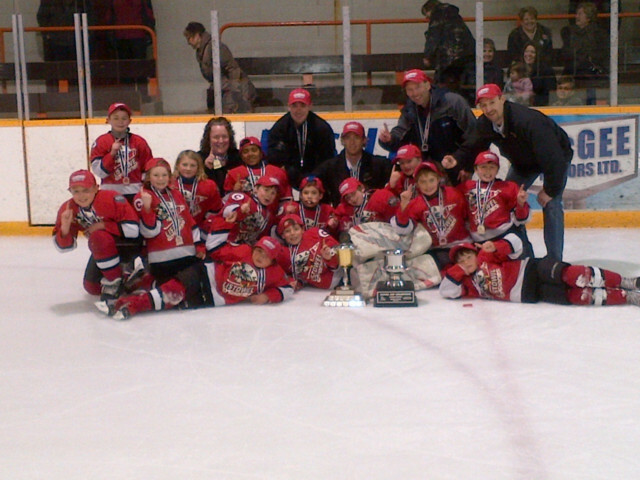 The Novice Rep Cyclones won the B Championship at the annual Gord Hymers Novice Rep B/BB tourney. The Novice Reps had a little time off before the start of playoffs so they had an exhibition game against Milverton to stay in game condition. Missing Carter Coombs for the game, who for some reason would have rather attend a Detroit Red Wings game, although no one knows why, the team would see their 2 AP's get some game action. The game was back and forth action and the final result was a 2-2 tie. Ben Nauta and Harrison Meulensteen scored the goals unassisted.